Rafting is about nervous anticipation…heart stopping build-ups…meeting the challenge…the thrill of the rapids…the solitude of the calms…sights seen…..experiences shared…..knowledge gained…campfire tales…new found friends. All of it sums up a trip of a lifetime, there for anyone with an inclination to experience, as we did, the best of a white water journey on rafts – probably the only adventure sport which enables a complete novice to attain an adrenalin rush at par with that of a professional, each and every time. The Ganga can easily stake its claim to being the river rafting ‘capital’ of the country. And aptly so, a river which has so thoroughly dominated the conciousness of millions in the country, a river which harbours over 90% of white water running in India. 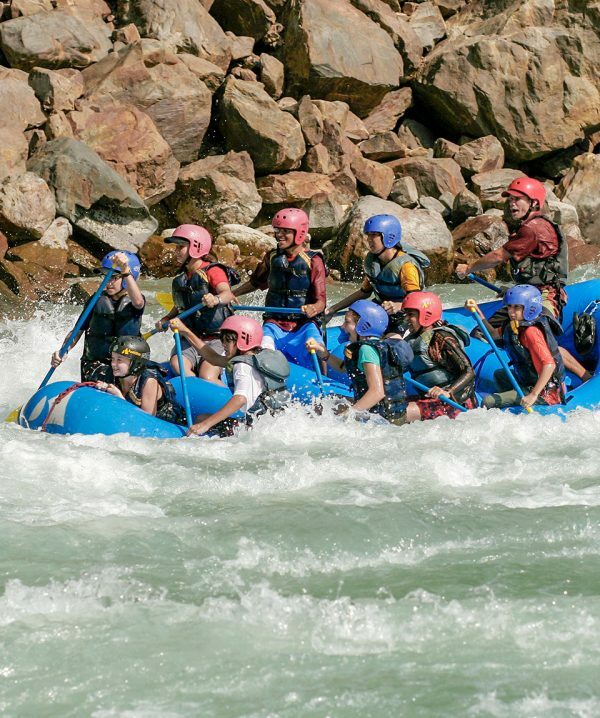 The sandy, silver beaches along the Ganga set amidst verdant ridges of the Shivaliks are home to river rafting camps which offer this activity. Barely six hours from Delhi, rates high on the list for someone looking forward to a healthy tan, an exciting river journey and an outdoor camping vacation. River rafting options range from a quick day-run to two/three day long weekend trips. And, for those who have more time on their hands, a multi-day self-contained river expedition is an adventure option with few rivals. An early morning drive out of Delhi to beat the traffic and the heat and six hours later, we are walking down a jungle path to our river camp in time for a quick dip in the Ganga and a wholesome lunch. Followed by a briefing about camp, the do’s & don’ts, and the programme. Bio-toilets are dry pits, very clean and user-friendly. Flush toilets are not recommended, as it invariably seeps closer to the water table. 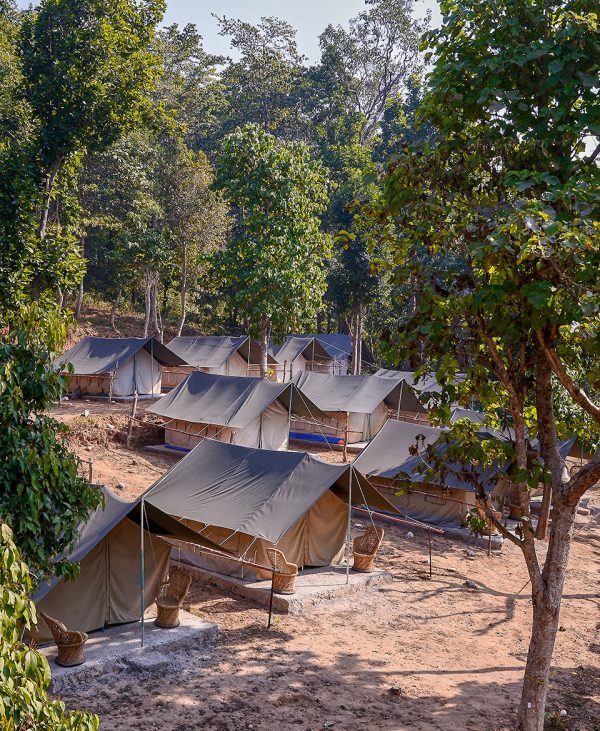 Being in surroundings such as these, one begins to appreciate the importance of being environment-friendly and basic in these camps. A nice, hot lunch is laid out under an open parachute and after a quick siesta, the afternoon river run is about to happen.Thereafter, life jackets and helmets are handed out as our river guide beckons us to the inflated raft where a comprehensive river safety briefing begins. One is briefed about the rapids to be encountered, paddling commands, “highside” commands, procedures to be taken if one of us is to fall out and what to do if the raft itself overturns. It does not happen often, according to our captain. A long flat section below, we are about to encounter our first “big one”, called “Three Blind Mice”. This turns out to be a set of three rapids, following one after another. It is a real quick one and before we know it, it is behind us in a flurry of hastened paddling strokes and shouted commands, leaving us completely wet, dazed and gasping for more. The foot braces in our raft are a blessing as they keep us from falling out of the raft in the bigger rapids. All rivers originating in the mountains form rapids due to loss of gradient, constrictions and obstructions, on its way to the plains. These rapids are graded on a scale of I to VI based on their size and the degree of difficulty encountered while negotiating them, Grade VI being unrunnable or suicidal. Any adventure sport, including rafting has its own inherent risks. Yet, they are lessened in a good professional set-up with competent river guides, world class equipment and an over-riding concern for safety. We are now introduced to “bodysurfing”, a great way to ride a rapid. Out of the raft and lying on our backs! A trifle scary at first, but the guides reassure us overcome the mild fear creeping up our spines at the thought of jumping into the cold water. We manage to gather courage in numbers and jump out only to realise the joy of the river, taking us down forcefully, yet gently enough to provide us with the ride of our lives. The river is definitely addictive, and there seems to be no reason to deny it. In fact, most of our boat-mates end up spending more time out of the raft than in it. A few smaller rapids under our belt, we feel like seasoned rafters, only to be a little concerned at a distant roar which seems to get louder as we float down the valley. It is the “Roller Coaster”. We tighten our lifejackets and helmets with a re-emerging sense of anxiety and urgency. It turns out to be true to its name, with our paddles hitting mostly air, the raft climbing on to some very decent sized waves, our guide trying very hard to manoeuver the raft since some of us have just got their first taste of big white water, leaving us with justified momentary paralysis. We ride through the “Golf Course”, “Club House” and many more interesting rapids before driving back to our camp for the night. Between tea and `pakoras’, a game of beach volleyball is easily tucked in. Enthusiastic participation is guaranteed in this activity by even the most unatheletic as the sand proves very conducive to athletic moves. Rapelling is a good option for those not inflicted with vertigo. The evening turns out be quite pacy before one sits down and begins to appreciate the river, camp and the surroundings. Our camp happens to be upstream of an old suspension bridge leading to a village on the opposite bank – the best real estate one has seen for a long time. Evening descends, and watching the cattle cross the bridge and the smoke rise from the houses in Malakhunti village reminds me of a Jim Corbett book, recently read. It is also time to wash the sand off and a quick dip seems to be in order. The campfire is lit and the evening stretches late after dinner, well aided by a guitar, a pair of wonderfully well-tuned vocal chords and some very interesting people. 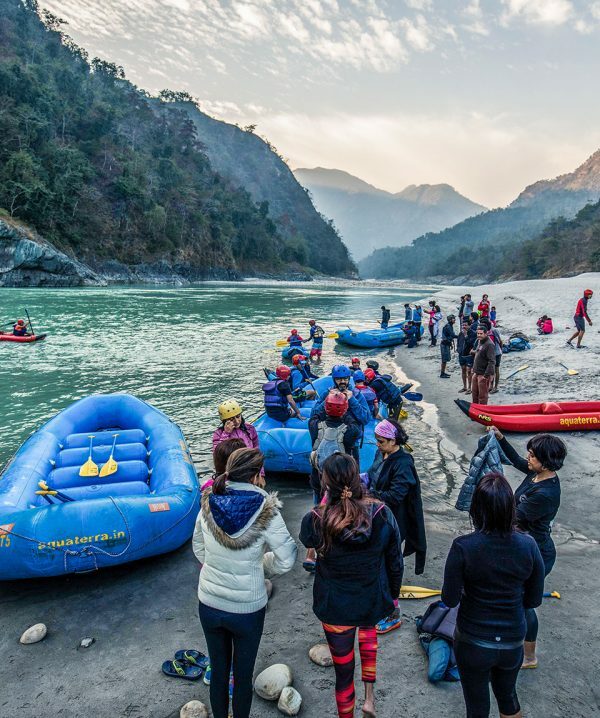 Next morning, we leave for what we came for – a self contained expedition trip on the Bhagirathi river, supposed to be the most exciting river trip in this part of the country. We are driven four hours to a point below the controversial Tehri dam where we meet our river guides – Vikram, JD and Sanjay. JD is going to be on a safety kayak travelling along with our rafts for the entire duration. They have been here for a day now, preparing for the trip. All our apprehensions are laid to rest by the friendly trio, who have rafted all major white water that India has to offer. There are ten of us who are to spend the next few days in near complete wilderness. The adrenaline is already soaring with the prospect of undertaking this trip. We unload our sleeping bags and belongings into big water-proof dry bags and watch the gear being tied on to the raft. Everything from our personal clothing to tents, food and utensils are loaded onto both the rafts. The self-containment aspect of this river journey is what makes this trip enjoyable. The teamwork involved and the isolation in which we travel make it a complete outdoor experience. Incidentally, the Bhagirathi river also has over a hundred rapids from Grade 1-4 till it meets the Alaknanda river at Devprayag to form the Ganga. We begin our journey after a briefing and are into a big rapid almost immediately. The Bhagirathi runs through a arrow gorge for a good part of the first day with some very exciting rapids. It is a day of highs, with the crew alert to the command of our boatmen, hitting big waves head-on, rafts smashing into formidable “holes” and running the rapids with near precision. The Bhagirathi pushes strongly, the river is higher than usual, we are told between consecutive Grade 4’s. It’s a day of quiet calms too, a chance to chat up with the other members and make friends with strangers. The rafts are two independent units and in a way, our progress downstream is dependent on the interaction we have betwen each other. A few jokes lighten the atmosphere after a big rapid until we stop for the night at a beach christened “Cobra Beach” by our guides. It has a rock on the left bank of the river which does look like the head of the reptile. The gear comes off the boats and the next half an hour is a frenzy of tents being pitched, kitchen being set, people changing into dry clothes and campfire driftwood being collected. Before we know it, the cook travelling with us has hot tea and sandwiches on a table which has suddenly been surrounded by our hungry expedition members. A game of Pictionary is on and the guides invariably win – they carry it on every trip of theirs. Some of us are game for a round of football. The evening campfire is an experience to savour. J.D, Vikram and Sanjay tell us tales of other rivers run, about the behaviour and moods of different rivers. Next morning, the river takes us through another gorge after passing below Naggar village, where we stop and take a quick hike to be rewarded with a hot cup of tea on arrival. We soon enter another gorge where we run some continuous Grade 4 rapids, describing which would be a string of unending expletives. It culminates at a small waterfall where the Bhagirathi drops a few feet – a big rapid which we stop for while our guides scout ahead to have a look. “White water reading” is the key to rafting a river successfully – the art of scouting a rapid, spotting its hazards, plotting a course around them and last but not the least, running it carefully to make sure the crew comes through safely, adrenalin rush intact. Our guides return and we run the “chute” splendidly. It is a terrific run. Quite easily the best so far, with the added build-up of the scout. However, we are proved wrong a few kilometres below. Just above Devprayag, there are two consecutive Grade 4+ rapids which are “honking”, according to one of us who has picked up river lingo very quickly. We do a quick scout, and run them fairly easily, hitting a few “holes” on our way down. “Holes” are massive re-circulations of water that make river rafting worth the effort. Next, we pass Devprayag, where the we meet the Alaknanda. Here, the raft immediately feels more buoyant as the river volume nearly doubles. We are once again on the Ganga. The holiest of all rivers. It is river which has completely taken over our senses in the past few days. After a quick lunch stop at a secluded beach, we raft on to camp at Beas Ghat, an angler’s delight because of the abundance of Mahseer found here, also known as Ganga Gold. A walk along the enormous concave beach on which we have camped, leads us to an early night, tired by the days efforts, with muscles whose existence we were not aware of now crying for attention. Next morning, we begin a long float to Kaudiyala – the start of the regular commercial section. We negotiate the “Daniel’s Dip” without much ado. That makes us feel quite like professionals ourselves. Then, a few kilometres downstream, we have our first casualty on “The Wall”. This is a particularly big rapid on which two of our band fall out. But they are rescued within seconds by JD in his kayak, following closely. A little shaken and quite wet, comes the realisation that the river can never be taken for granted. Later, an hour below our camp is the bridge we left a few days ago. Here, we meet another bunch of rafters-to-be who have come upriver for the week-end. What inevitably follows is a mildly exaggerated version of our expedition to a wide-eyed audience. Under a starlit night, our guides tell us they have a name for this phenomenon…River lies, anybody? ?….